Abadia Hotel, with its ancient 16th century style house and patio, is the single most enchanting, romantic and wonderful hotels in Spain! The price is really good as well as the hotel has a lot far more character than the other places in Spain we stayed at inside the same value bracket. We were really pleasantly surprised. Staff really warm and friendly and helpful. It took quite a long time to uncover the hotel at night, but the Girl at the reception desk was extremely helpful, made suggestions and highlighted good points on the map for me (eg other reception employees next days were not that helpful and friendly). Superb courtyard! Nice and clean hotel, good value for money. It was really clean. The carpark was indeed secure. It is a closed garage for the flats opposite and spaces 12 and 13 belong to the hotel. Some reviews said that the carpark was just a clearing. That is certainly not true. We were offered a flat up the road instead of our twin room, which we accepted. The other property looks the same as the actual hotel and is around 200 metres up the road in a quieter area. The management seems Francophone and English is also spoken. They look like they know the industry nicely which is refreshing for a change. The apartment had a kitchenette, bathroom (no bath-tub), washing machine, microwave, fridge, kettle and A/C. They also let you leave your suitcases at reception and let you use the shower/bathroom downstairs in case you have to leave in the afternoon. I will be back. Very friendly staff who speak English and provide useful advice. Parking offered in a garage across the street. Full of character and great value for money. The entire set up of the location was beautiful. The architecture along with the courtyard garden was tremendously charming. It was one of the finest location of holiday accommodation that I stayed in whilst I was in Spain. I would definitely go back there if i had a chance. The rooms were beautiful, The staffs were friendly. It was a great experience. The reception employees made us really welcome when we arrived. They gave us maps and spent time with us making suggestions and highlighting good things on the map for us. They gave us advice about visiting times and transport selections for local attractions. The spot was full of character with a lovely central square. It was clean and light. We had fresh towels daily and were able to get coffee, wine etc any time. The Abadia is lovely. 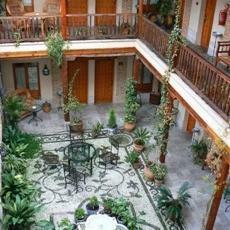 The courtyard is just perfect for resting and enjoying a drink right after your Granada experience. The. . ooms have everything you need and are warm and cosy. This hotel was clean and bright. There were tea-making facilities and a refrigerator in our room. Although there were 3 of us in one room, the room did not feel too small. Kim the receptionist was extremely helpful and friendly. The room was stunning and plenty large enough for three people, and bathroom excellent. It also had a stunning courtyard. * Abadia Hotel rated 4.89 out of 5 based on 9 customer reviews. Hostel reviews with a star rating are sourced from HostelBookers. If you find Abadia Hotel with the same booking conditions at a lower rate somewhere else on the internet after you have booked, we will refund you the total difference.